Make a delicious tasting cup of coffee like a world class Barista. 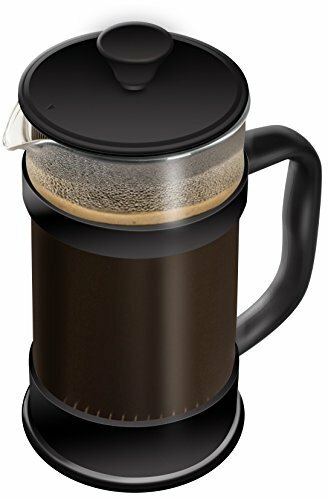 For decades,a french press is simply the best at making the purest cup of coffee espresso or tea. Its classic method effectively extracts any coffee bean's essential oils, delivering bold unique flavor directly to your cup, that is otherwise lost in paper filters Smart Barista's know the foundation of a great cup of coffee starts with a reliable & well-built coffee espresso tea press Plunger and filter parts constructed with flimsy plastic & rubber are destine to fail. So we designed a 3 piece stainless steel infuser filter system ensuring taste-free parts so nothing comes between you & your coffee beans Also, a poor frame design with a brittle glass teapot will likely lead to accidental cracks with typical everyday use. These conditions is the difference whether you enjoy your french press for a few months or for many years to come The fun modern design is inspired by top Baristas from around the world that demand durability & style Our high quality glass teapot is specially made from borosilicate glass, making it resistant to thermal shock, great for camping.